TruTV is kicking things up a notch. Today, the network announced they’ve ordered more episodes of Comedy Knockout, Fameless, and Greatest Ever. TruTV has also ordered a new scripted comedy show called Bobcat Goldthwait’s Messed Up Stories. Bolstering this growing roster of originals, truTV also announced today it has ordered a 16-episode second season of the comedy competition series Comedy Knockout, as well as greenlit 12 additional episodes of Fameless and 10 episodes of Greatest Ever. Hosted by Damien Lemon, Comedy Knockout pits comedians against each other in a series of fast-paced challenges, with the audience having sole discretion to decide who is the funniest person in the room. The whole time, the comedians throw roast-like, rapid-fire jabs at each other to knock their opponents off balance. Each show ends with one comedian crowned Champion, one eliminated, and one ultimately forced to face the crowd and apologize for going down in shameful defeat. 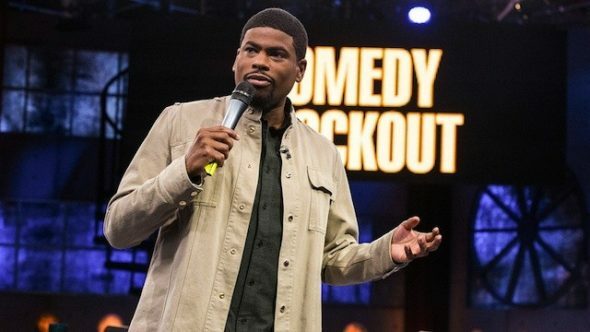 Comedy Knockout will return to truTV this winter with 16 new half-hour episodes after a successful 26-episode first season. The series is produced by Embassy Row with 3 Arts Entertainment. Michael Davies, Amanda McPhillips, Julia Cassidy, Mo Mandel, Tim Fornara, Josh Lieberman and Greg Walter serve as executive producers. The series concept is by Mo Mandel. Fameless is a genre-busting half-prank, half-sketch show from the mischievous mind of David Spade. truTV has placed an order for 12 additional half-hour episodes, bringing the season two total to 24 episodes, which will air this winter. The series is produced by Electus and Entertainment One (eOne) with David Spade, Ben Silverman and Kevin Healey of Propagate, and Tara Long of eOne serving as executives producers. Freshman series Greatest Ever, hosted by comedian Amanda Seales, is a fast-paced, informative and fun pop-culture comedy countdown show that takes viewers through the “do’s” and “don’ts” of topics like weddings, animal videos, sports, politicians and awesomely, unintentionally funny inventions, infomercials and products. Bringing the total number of season one episodes to 16, the series will return early 2017 with an additional 10 half-hour episodes and is produced by Meetinghouse Productions with Jason Cilo serving as Executive Producer. These programming moves look to bolster truTV’s unparalleled ratings momentum and consistent growth across key demographics. According to the latest available Nielsen data, the re-branded comedic network has delivered three consecutive quarters of growth among adults 18-34 in prime time, making it the only cable entertainment network in the top 30 to demonstrate increased viewership among that highly-coveted audience in that time frame. Additionally, truTV is growing in its total day ratings, registering gains among adults 18-34 and adults 18-49 across that same time period. What do you think? Do you watch truTV? Do you watch any of these programs? More about: Comedy Knockout, Comedy Knockout: canceled or renewed?, Fameless, Fameless: canceled or renewed?, Greatest Ever, Greatest Ever: canceled or renewed?, TruTV TV shows: canceled or renewed? Comedy Knockout is a terrible show. It is incredible to me that they got a second season. I’ve been a huge fan of stand up my whole life and I’ve never seen it done so horribly. The humor is so dry and corny, most of them are just not funny. The concept was good, but the talent just isn’t there. I’ve never reviewed a show before, I’ve never cared to, but I felt inspired to by just how painfully awful this television show is.